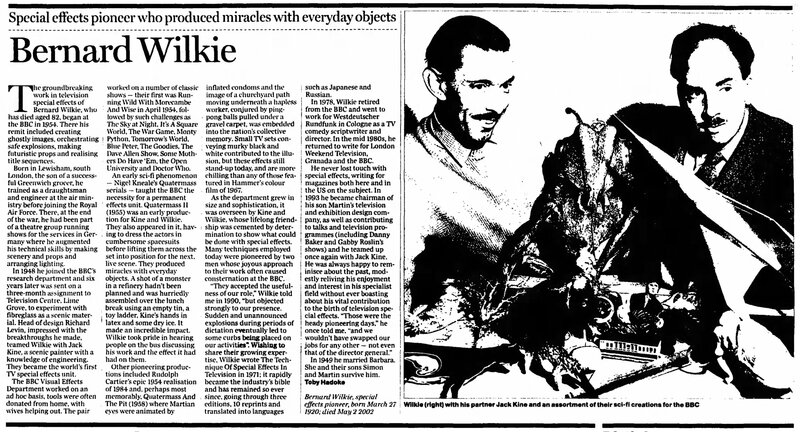 The groundbreaking work in television special effects of Bernard Wilkie, who has died aged 82, began at the BBC in 1954. There his remit included creating ghostly images, orchestrating safe explosions, making futuristic props and realising title sequences. Born in Lewisham, south London, the son of a successful Greenwich grocer, he trained as a draughtsman and engineer at the air ministry before joining the Royal Air Force. There, at the end of the war, he had been part of a theatre group running shows for the services in Germany where he augmented his technical skills by making scenery and props and arranging lighting. In 1948 he joined the BBC's research department and six years later was sent on a three-month assignment to Television Centre, Lime Grove, to experiment with fibreglass as a scenic material. Head of design Richard Levin, impressed with the breakthroughs he made, teamed Wilkie with Jack Kine, a scenic painter with a knowledge of engineering. They became the world's first TV special effects unit. The BBC Visual Effects Department worked on an ad hoc basis, tools were often donated from home, with wives helping out. The pair worked on a number of classic shows - their first was Running Wild With Morecambe And Wise in April 1954, followed by such challenges as The Sky at Night, It's A Square World, The War Game, Monty Python, Tomorrow's World, Blue Peter, The Goodies, The Dave Allen Show, Some Mothers Do Have 'Em, the Open University and Doctor Who. An early sci-fi phenomenon - Nigel Kneale's Quatermass serials - taught the BBC the necessity for a permanent effects unit. Quatermass II (1955) was an early production for Kine and Wilkie. They also appeared in it, having to dress the actors in cumbersome spacesuits before lifting them across the set into position for the next, live scene. They produced miracles with everyday objects. A shot of a monster in a refinery hadn't been planned and was hurriedly assembled over the lunch break using an empty tin, a toy ladder, Kine's hands in latex and some dry ice. It made an incredible impact. Wilkie took pride in hearing people on the bus discussing his work and the effect it had had on them. Other pioneering productions included Rudolph Cartier's epic 1954 realisation of 1984 and, perhaps most memorably, Quatermass And The Pit (1958) where Martian eyes were animated by inflated condoms and the image of a churchyard path moving underneath a hapless worker, conjured by ping-pong balls pulled under a gravel carpet, was embedded into the nation's collective memory. Small TV sets conveying murky black and white contributed to the illusion, but these effects still stand-up today, and are more chilling than any of those featured in Hammer's colour film of 1967. As the department grew in size and sophistication, it was overseen by Kine and Wilkie, whose lifelong friendship was cemented by determination to show what could be done with special effects. Many techniques employed today were pioneered by two men whose joyous approach to their work often caused consternation at the BBC. "They accepted the usefulness of our role," Wilkie told me in 1990, "but objected strongly to our presence. Sudden and unannounced explosions during periods of dictation eventually led to some curbs being placed on our activities". Wishing to share their growing expertise, Wilkie wrote The Technique Of Special Effects In Television in 1971; it rapidly became the industry's bible and has remained so ever since, going through three editions, 10 reprints and translated into languages such as Japanese and Russian. In 1978, Wilkie retired from the BBC and went to work for Westdeutscher Rundfunk in Cologne as a TV comedy scriptwriter and director. In the mid 1980s, he returned to write for London Weekend Television, Granada and the BBC. He never lost touch with special effects, writing for magazines both here and in the US on the subject. In 1993 he became chairman of his son Martin's television and exhibition design company, as well as contributing to talks and television programmes (including Danny Baker and Gabby Roslin's shows) and he teamed up once again with Jack Kine. He was always happy to reminisce about the past, modestly reliving his enjoyment and interest in his specialist field without ever boasting about his vital contribution to the birth of television special effects. "Those were the heady pioneering days," he once told me, "and we wouldn't have swapped our jobs for any other - not even that of the director general." In 1949 he married Barbara. She and their sons Simon and Martin survive him. APA 6th ed. : Hadoke, Toby (2002-06-03). Bernard Wilkie obituary. The Guardian p. 18. MLA 7th ed. : Hadoke, Toby. "Bernard Wilkie obituary." The Guardian [add city] 2002-06-03, 18. Print. Turabian: Hadoke, Toby. "Bernard Wilkie obituary." The Guardian, 2002-06-03, section, 18 edition. This page was last modified on 9 February 2019, at 02:38.